The real Julia Child, chef extraordinaire and one of the authors of Mastering the Art of French Cooking (Knopf, 1961), would be delighted by Kyo Maclear's latest picture book, though there is a cheery disclaimer that states that "the story contains no true knowledge of (the real) Julia Child" (pg. 1). 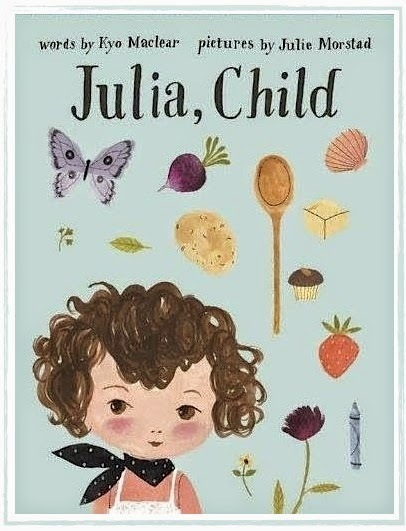 Julia, Child may not be the real Julia Child's story but the little girl who looks to sweeten the lives of others with culinary treats provides a savoury tale. From the taste of an extraordinary sole meunière at a young age, Julia's love of French food was whipped up, and her friendship with another young gourmet, Simca, feeds that passion. The two girls enjoy shopping for food and ideas at the market and experimenting in the kitchen, learning cooking and baking from the experts. The girls' goal is to continue cooking happily together even as adults. But the adults they see around them look harried and starved for the joy of childhood. And so Julia and Simca attempt to sauté, sizzle, simmer, and fricassee that joie de vivre back into the lives of the grown-ups they know. The subtle message and word play of Julia, Child is what made me such a fan of Kyo Maclear's first pseudo-bio picture book, Virginia Wolf (Tundra, 2012). Within Julia, Child, we are slathered with rich essences of joyous play in the kitchen and life. Julie Morstad, award-winning illustrator of How To (Simply Read, 2013) and Singing Away the Dark (Simply Read, 2011), adds her own whimsy to Julia, Child, emphasizing the methodical nature of cooking with her delineating ink lines and the wonder of childhood in her warm, bright gouache. While Julie Morstad's lines provide that definition and structure, her choices and frugal use of colour play up the extraordinary nature of the true joy of childhood. The collaboration of Kyo Maclear with Julie Morstad to create Julia, Child is as inspired and scrumptious as Julia and Simca's recipe for reviving youth. Bon appétit!